What is double napped right circular Cone? Why is it called right circular cone? What are the four types of conic sections? Why is it called a conic section? How is a circle formed? Cone is a 3D shape which has flat base and round lateral surface with a point on top. The point is called Apex or Vertex. The things having cone shape are called Conical. 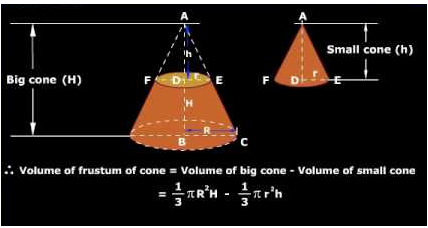 Cone is basically a formed by a rotated triangle. In a right angled triangle, its longer side rotates around its shorter side. So that it forms a cone. The side it rotates around is called axis of the cone. As the height shown in the above picture is the axis. When there are two lines intersect each other at a fixed point and at an angle  in which one is fixed vertical line .when the line rotates around the fixed vertical line so that the angle remains same, we got a double napped right circular cone. Nappe is the lateral surface or the round surface of the cone. 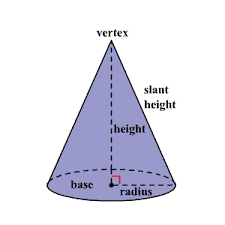 The cone above the vertex is called Upper Nappe and the cone below the vertex is called Lower Nappe. The fixed vertical line here is called the Axis. The line which is rotating is called the Generator. The fixed angle is called Vertex Angle. The intersection point of two lines is called Vertex. The vertex divides the cone in two nappes. It is called circular as the base is circle and right because the axis is perpendicular to the centre of the base to the plane. And in other words, it is made by the rotated right angled triangle so it is called right circular cone. When we cut an object into slices with a plane we get so many parallel cross sections. Likewise if we cut a right circular cone in pieces we could get different cross sections from it depending upon the way we cut the cone. The possible cross sections from a cone are Circle, Ellipse, Parabola and Hyperbola. If we intersect a plane with the right circular cone, we get a section, and that particular section is called a conic section. Or you can say that if we slice a 3D cone with a plane from different angles then we will get different sections and these sections are called the conic sections. In German it is called Kegelschnitt. Conic Section is a curve formed by the intersection of a plane with the two napped right circular cone. 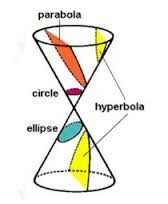 There are four types of conic sections, like, circle, ellipse, parabola and hyper bola. The circle, ellipse, parabola and hyperbola are called the conic sections because these are formed by the intersection of a plane with the cone. “Conic” as these are made out of a right circular cone and “section” as these are the sections or the pieces of a cone. To study about light, we have to study about parabolas. Like if you spot the light on the parabolic mirror then all light will focus on one point, which is called Focus. Circle is very commonly used everywhere. The paths which you see around the sun are the ellipse having sun at focus. In the systems of telescopes we use the hyperbolic and parabolic mirrors. The route of objects shot near the earth’s surface usually follows a parabolic path. To design the car headlights also, the parabola is used. All the conics play important role in physical processes in nature. from the universe to the atom, conic sections are important. It depends upon the location of the plane with reference to the cone and the angle made by the vertical axis and the intersecting plane, that what kind of conic section we get. Let the angle between intersecting plane and the vertical axis be ∅. Ɵ < ∅ < 90°, when the plane intersects with the double circular cone in such a way that the angle between the axis and the plane is greater than the vertex angle then it made an ellipse. ∅ = 90°, when the plane is perpendicular at the axis, or the angle of intersection of plane and the vertical axis is equal to 90°, the ellipse becomes the circle. Or you can say that circle is the special type of ellipse, the section is circle. Ɵ = ∅, when the angle between the vertical axis and the plane is equal to the vertex angle, we get an open curve called Parabola at the intersecting surface of the cone. Ɵ < ∅, when the angle between the plane and the vertical axis is less than the vertical angle, the plane intersects both the nappes of the cone which form two disjoint open curves are called Hyperbola. When Ɵ < ∅ < 90° in case of ellipse or ∅ = 90° in case of a circle, then the section is a point . When Ɵ = ∅, in case of parabola, the plane contains a generator of the cone and the section is a straight line. A circle is formed when we cut the right circular cone with a plane so that the plane is perpendicular to the symmetric axis of the cone. The curve we get with this intersection is called Closed Curve. For circle we can say that circle is the set of all the points which are at equal distance from the center. where (h, k) are the coordinates of the center point and r is the radius of the circle. By using these equations we can draw a circle on the graph. We have to draw a circle with center (3,-2) and radius 4. 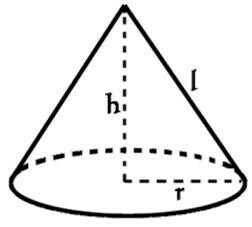 A cone does not have uniform cross sections when it intersects with the plane. So the surface area will change according to the sections of the cone. In case of circle it will be called frustum. 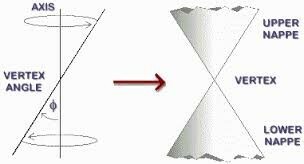 Frustum is formed when a plane cut a right circular cone in such a way that the upper and lower bases are circular and parallel. Let the radius of the base is r1 and the radius of the top circle is r2. Height is h and the slant height as l.
In which  is the area of the base. Here a small cone is cut by the intersecting plane in such a way that the height is perpendicular to the center of the base of the cone. 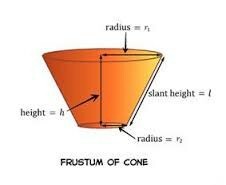 To calculate the volume of the frustum we need to subtract the volume of the small cone from the volume of the big cone.